ELIZABETH CITY – Amazon claims its large-scale wind farm near Elizabeth City will produce enough electricity “to power more than 61,000 U.S. homes,” but neither the online company nor its wind farm operator Avangrid will share data supporting that claim. Amazon continues to perpetuate the misleading notion that the electrical grid can take power from wind turbines, store it, and direct it for actual use by faraway data centers on the same grid. If Avangrid Renewables and online retail giant Amazon wish to prove that it is indeed feasible, then make the data public, several state lawmakers say. With data in hand, the legislators say, policymakers can evaluate the benefits of other proposed wind projects in North Carolina. The operators so far have refused to do so. Sen. Bill Cook, a Beaufort County Republican, represents all or parts of eight counties in the northeast, including the area containing the Amazon Wind Farm. Cook, a retired manager at Potomac Electric Power Co., told Carolina Journal the power from the wind farm is unreliable and can’t actually power any Amazon data center. “They should share the output data and should also tell us what it costs to run those things,” he said. Virginia-based Apex Clean Energy is exploring the feasibility of building a 300-megawatt project in Perquimans and Chowan counties. The Amazon Wind Farm is the state’s first large-scale commercial wind generation project. It became fully operational in February. The 208-megawatt project comprises 104 2-megawatt wind turbines using three wind blades. Each turbine has a 305-foot tower and a wind blade radius of 187 feet, reaching a total height of 492 feet from the ground. The overall footprint of the wind farm encompasses about 22,000 acres. CJ asked Avangrid spokesman Paul Copleman to share wind data or electrical output data for the wind farm. Copleman’s answer was short and blunt. Amazon did not respond to CJ requests to discuss the project. The Amazon Wind Farm isn’t connected to the Amazon data centers near Dulles International Airport in Northern Virginia, which, the company claims, the North Carolina turbines supply. The intermittent energy from wind generation can’t match the actual demand of the data centers. Richmond-based Dominion Virginia Power provides retail electricity to Amazon’s data centers in Virginia, and those centers will continue to operate with the same mix of fuel types that power other Dominion customers. In 2015, that mix included 30 percent nuclear, 26 percent coal, and 23 percent natural gas. Renewables – including solar, wind, and hydro – constituted 3 percent. “Keeping up with our commitment to 100 percent renewable energy,” reads a statement on the Amazon Web Services website. The claims appear to be part of a marketing effort to persuade large data users that AWS cloud services are better for the environment than other providers, such as Microsoft and Google. “Combining the fraction of energy required with a less carbon-intense power mix, customers can end up with a reduction in carbon emissions of 88 percent by moving to the cloud and AWS,” the website says. Dominion Power considers only 13 percent of a wind farm’s output “firm capacity,” available for use on the regional electric grid. That amount would supply about 22,000 homes. But due to the unpredictable nature of wind power, no Amazon data centers or any actual homes will depend on this wind farm to supply their needs. Iberdrola, a Spanish company, has been working on a North Carolina wind farm project since 2008. The company put the project on hold in 2012 after announcing it couldn’t find a buyer for the electricity expected to be generated from the project. In 2015, Amazon announced it would buy the power from the wind farm through Iberdrola’s newly formed subsidiary, Avangrid. But Amazon, at this site, isn’t in the energy production business, so its role is more like buying the naming rights to the output from the wind farm. Amazon did not respond to several requests to discuss the completed wind farm and the company’s data centers. In 2015, CJ tried to discuss the wind farm project with Amazon’s Global Communications operations manager Mary Camarata, who asked for written questions. Among the questions CJ submitted: How much power is currently consumed at the Virginia data centers? How much would AWS be paying Iberdrola for power? And, what is the net cost to AWS for the project? The environmental group Greenpeace called out Amazon in an April 2014 report about electricity consumption at large data centers. “Among the major cloud providers, only Amazon refuses to provide any details on the energy performance and environmental impact associated with its operations,” the report says. Greenpeace continues to monitor and to criticize Amazon. The Amazon Wind Farm uses the Gamesa G114-2.0 model turbine. According to Avangrid’s Copleman, that model starts generating power when the wind reaches a speed of about 7 mph, reaches 50 percent capacity at about 11 mph, and reaches peak capacity at about 17 mph. Using a handheld wind meter, from Feb. 8-10, a CJ reporter took multiple wind readings at or near the site. The wind varied between 0 and 23 mph. In 2012, the average annual electricity consumption for a U.S. residential utility customer was 10,837 kWh, an average of 903 kilowatt hours (kWh) per month. The rated capacity of the wind farm is 208-megawatts. If the wind farm was operating a full capacity all the time, or 8,760 hours per year, it would generate 1,822,080 megawatt hours. Amazon’s output estimate of 670,000 megawatt hours per year divided by the total potential of 1,822,080 comes to a useable percentage – or the industry term capacity factor – of 37 percent. But the 37 percent figure represents an average of what might be available based on the variable wind conditions at any particular wind farm. How much power can actually be used on the electrical grid depends on many factors, including what other sources, such as nuclear, coal, or gas are being used when the wind is available. Dominion’s most recent Integrated Resource Plan provides some insight into the wind power output the utility considers reliable. Dominion in April 2016 filed the plan with the Virginia State Corporation Commission and the North Carolina Utilities Commission. Using a 13 percent firm capacity would reduce the estimated number of homes from 61,000 to 21,857. CJ asked the coalition’s president, Katharine Kollins, whether Amazon and Avangrid should share output data for the Amazon Wind Farm. “I think that sharing output data with the public should be entirely their choice. This is a private business deal involving those two parties, not our monopoly utility that is required to disclose prices in an effort to comply with utility laws. The amount of power generated from the facility and purchased by Amazon is not at all relevant to other electricity consumers,” she replied. Rep. Bob Steinburg, a Chowan County Republican, represents all or parts of six counties in northeastern North Carolina. A portion of the wind farm falls within his district, and he has been a strong supporter of the project. CJ asked him whether he thought Amazon and Avangrid should share output data. “I see no reason given the contractual agreement that is in place between Avangrid and Amazon that would necessitate either to release that information. No consumers of utilities are being negatively impacted price wise, regardless of what the financial arrangement is between the aforementioned entities. In fact, given that and the competitive nature of companies like Amazon vying to be the leader in the utilization of renewable energy, it is, in my view, similar to protecting trade practices and secrets from competitors seeking to gain an advantage over same from information they might not otherwise be entitled or privy to,” he said. Sen. Norman Sanderson, a Pamlico County Republican, believes otherwise. The project, Sanderson said, received public grants or tax credits. “We need to see the total picture so we can better evaluate future projects,” he said. Rep. Chris Millis, a Pender County Republican, is a civil engineer who also has closely followed the Amazon Wind Farm project. He agrees with Sanderson. “The output numbers should be made public. Private actions by private business should be kept as such, but when a private business makes a public claim, regardless of the motivation, it is only proper to back up the claim with hard evidence and proof. Since Amazon is claiming that they will be halfway to their goal of achieving ‘100 percent renewable energy usage’ by the end of the year, it is both reasonable and proper for Amazon to be transparent to the very public their sustainability claims are targeting. Amazon and Avangrid have campaigned to the public with specific renewable generation figures; therefore, unless they have zero regard for being guilty of false advertising, they should substantiate their public claims with hard evidence. “If their claims are true, then what do they have to hide?” he said. Should future projects share their output numbers? “It should be disclosed for wind projects along with any other form of energy production. Transparency and accountability is always good, and there is no business advantage being lost in simply providing evidence to substantiate the claims of any energy provider. In regard to wind projects specifically, I consistently hear repeated lies from the media with false claims attempting to paint a better-than-actual picture of the unreliable and intermittent energy source; therefore, it would be healthy for the public to have the truth about the matter once and for all,” he said. But most news reports advanced the notion that wind-generated energy could be directed to the Amazon data centers. “The power generated by the wind farm, enough to power more than 61,000 U.S. homes, will be supplied exclusively to an Amazon data center,” stated a July 2015 press release from Gamesa, the wind turbine manufacturer that would produce 104 turbines for the project. “The Amazon Wind Farm U.S. East, to be built in Perquimans and Pasquotank counties, will power the online retailer’s cloud-computing division, Amazon Web Services, as part of a corporate goal of achieving energy sustainability,” wrote The News & Observer of Raleigh in 2015. “Amazon Web Services, itself a multibillion-dollar enterprise, plans to hit a target of 40 percent renewable usage before 2017, a milestone toward its goal of one day operating solely on renewable power,” wrote the Daily Advance of Elizabeth City in 2015. “The project is expected to open in December 2016 when it will supply power to Amazon Web Service data centers,” wrote Bloomberg Business in 2015. 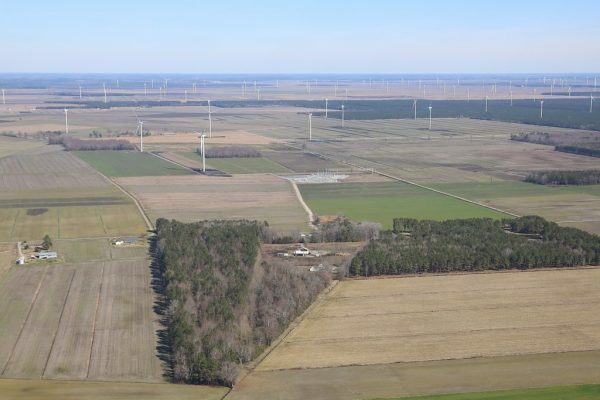 “Before the ball drops on New Year’s Eve, 104 wind turbines scattered across 22,000 acres of farmland near Elizabeth City, North Carolina, will be churning out electricity. It will be the South’s first large-scale wind farm. At 208 megawatts, Avangrid’s facility has the capacity to capture enough of the sky’s kinetic energy to power 61,000 homes. But instead of homes, this electricity will run data centers for Amazon Web Services, a subsidiary of Amazon.com,” Robynne Boyd wrote for EcoWatch in December 2016. “Amazon is buying the power produced in rural, northeastern North Carolina to run its Virginia data centers,” stated an Associated Press story that first appeared Feb. 10. But this isn’t the case, as we have continued to report.